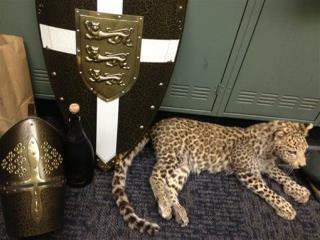 Teens Throw Mansion Party, Take $250K Leopard: Sixteen suspects described as "kids of means" have been arrested after a wild, 17-hour party in a wealthy Los Angeles suburb, where a $7 million mansion was trashed and partygoers made off with a bizarre assortment of loot—including a snow leopard valued at $250,000. Indiana Hero Teen Shot Dead by Friend: An Indiana teenager honored for saving two young lives with an act of heroism has had her life taken away on Sunday by what appears to have been an act of incredible stupidity involving a friend and a gun. Man Kills Pregnant Couple in Botched Suicide Attempt: A former Fortune 500 executive told police he was trying to kill himself when he drove his pickup truck across the grassy median of a New Hampshire highway and slammed into an SUV. What happened instead was much worse. Teen Kills 4 in DUI, Escapes Jail Sentence: The crime isn't fresh, but the sentence is: Ethan Couch got drunk last June, drove with a blood alcohol level three times the legal adult limit, and killed four pedestrians. But instead of the 20 years the 16-year-old Texas teen could have served in prison, he got 10 years of probation, and the reason why is crazy. Man Nabbed Over Prank Calls to Pro Coaches: A Los Angeles man has been arrested after allegedly making prank calls to at least a dozen big-name NFL, NBA, and college football coaches. And because police say Kenneth Tarr recorded them for posterity, he faces eavesdropping charges.